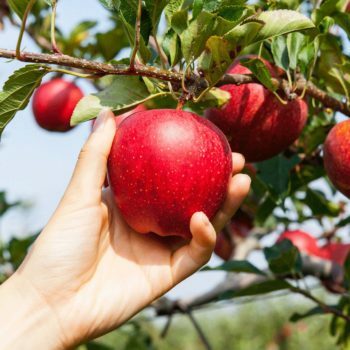 Ever wonder how to pick the perfect apple? Apple Holler’s Guide to Apple Picking will tell you all that you need to know. For 30 years Apple Holler has cultivated the juiciest, tastiest apples around. But there is more to the experience than just buying apples. Each year we invite you and your family to come spend a day at the farm picking apples and enjoying family friendly activities. 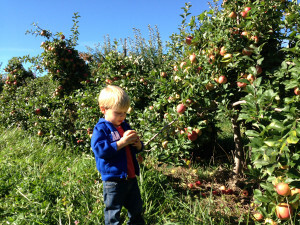 With dwarf trees, it is easy for anyone to pick apples at Apple Holler. With many branches close to the ground even small children can join in on the fun. Apples ripen from the outside of the tree towards the trunk. If you are unsure of ripeness, stick to apples that are furthest from the base. Look for apples that are firm with no nicks or bruises. The right color depends on the variety. Ask an orchard employee if you are unsure. Ripe apples are crisp and firm to the touch. When you find an apple you like, lift the apple upwards and give it a little twist to release it from the tree. Don’t pull the fruit down or shake the branch. Keeping the stem on the fruit will help it last longer. Apple Holler has 30 varieties of apples, each with a unique texture and flavor. Apples can be crispy or crunchy with a tart, tangy or sweet flavor. Apples are used in salads, pies, sauces, and baked goods. Canning and freezing are ways to preserve the fruit for longer periods of time. Step 1: Choose your apples: You will need 2 ½ – 3 lbs of apples per quart. Sweet apples don’t require the addition of sugar. Using several varieties together makes for great flavor. Step 2: Sanitize jars and lids. To do this, wash in hot soapy water. Once clean, boil them in water for 10 minutes. Keep the jars in hot water until you are ready to fill. This prevents breakage. Step 3: Clean, peel, core and slice. Rinse apples in cold water and then peel off the skin. Skins become tough when canned. 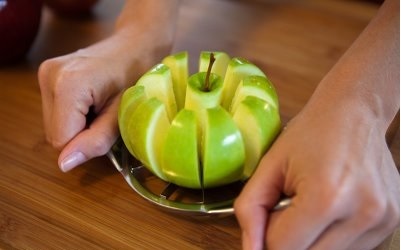 Use a corer/slicer or a knife to make slices ¼ – ½ inch thick. Step 4: Blanch the apples. You do not need to cook them through, just boil for 5 minutes in water, apple juice or a simple syrup (sugar dissolved in hot water). Blanching protects the flavor of the apples while in storage. Step 5: Drain the apples but keep the liquid, you will need it later. Step 6: Fill the jars. First, place the blanched apples into the jar leaving ½” of space at the top. Next, add in the drained liquid to fill the gaps between the apples. Leave the ½” at the top open. Step 7: Clean any spills off the jar, seat the lid and tighten the ring. Step 8: Process jars in a hot water bath. 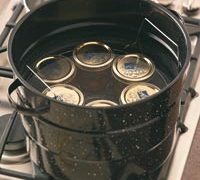 Keep the jars fully submerged in boiling water for 20 minutes. Jars should not touch each other or the sides or bottom of the pot. Step 9: Carefully remove jars from water bath and place them on a wood block or heavy towel to cool. Canned apples will stay fresh for 12 – 18 months. Beyond canning there are a wide variety of uses for your apples. Apple Holler has a collection of delicious recipes to help you get the most out of your pick. Click here to check out other apple recipes. What you need to know about Pristine & Sansa Apples!